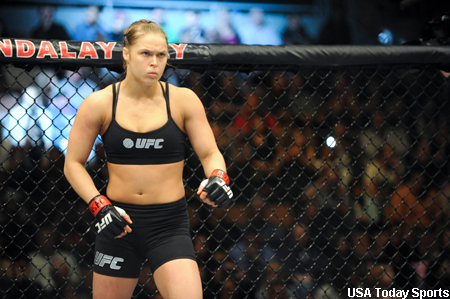 Ronda Rousey (pictured) is the first woman to don a UFC title, and now the “Rowdy” one is the only mixed martial artist to own an ESPY. On Wednesday, Rousey beat out basketball stars Maya Moore and Breanna Stewart, as well as skier Mikaela Shiffrin in the “Best Female Athlete” category. Since last year’s award show, Rousey has successfully defended her bantamweight title three times in highlight reel fashion. “I think @RondaRousey winning best female athlete isn’t even arguable,” reigning UFC light heavyweight king Jon Jones tweeted after Rousey collected her hardware. It marked the third consecutive year “Money” has collected the trophy. Rousey’s next opponent has yet to be announced, but the UFC’s golden girl is hoping to return to action before the end of the year. UFC middleweight champ Chris Weidman was also up for an ESPY for his UFC 162 upset special over Anderson Silva. However, Mercer took “Best Upset” for their win against Duke in the 2013 NCAA Tournament.